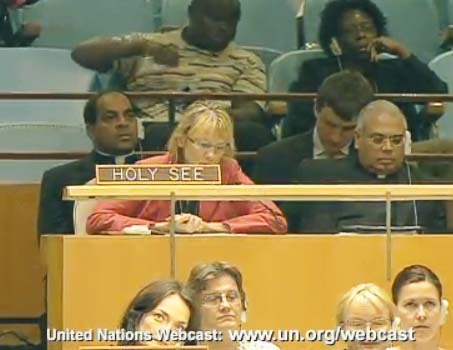 The “Holy See” and its “Military Order of Malta” are represented at high level talk in the United Nations. A Vatican approved archbishop represent the Pope in the United Nations. Statement by H.E. 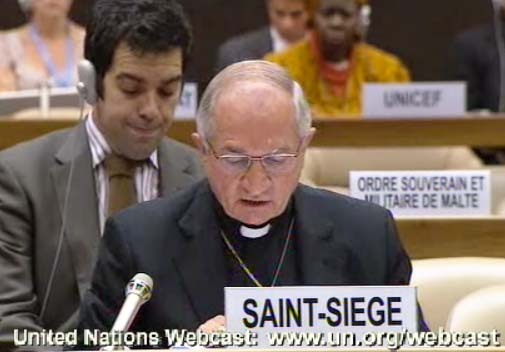 Monsignor Silvano M. Tomasi, Apostolic Nuncio, Permanent Observer for the Holy See to the United Nations in Geneva at the 2011 High-level Segment of the Economic and Social Council. What do Unicef and the Military order of Malta have in common? They are both represented in the “High level segment” of the United Nations. Together they try to find a way to establish the One World Government. The Bible explain that such a government shall come, and that a supreme King shall rule the World. One of the heads of the beast seemed to have had a fatal wound, but the fatal wound had been healed. The beast was given a mouth to utter proud words and blasphemies and to exercise his authority for forty-two months. He opened his mouth to blaspheme God, and to slander his name and his dwelling place and those who live in heaven. The Holy see” is one beast that will accept the final beast that will come up form the “sea”. In the sense, suddenly appears on the World stage, promoted as the chief partner for “global peace” . The kingdoms on the Earth is getting ready to give the One World Government the absolute political power. The present kingdoms will eventually unite, and accept the authority and powers of the beast. He is soon going to manifest in flesh, and walk into the rooms of power. He will be hailed and rule over them. The Vatican is a permanent observer in the United Nations. Just like the PLO. You must be careful not supporting this wicked assembly, who pave the way for the last and final antichrist. You must submit to the teaching of the Messiah. His name is English is Jesus, and He was born into flesh in acient Israel. He will not seek dominion over a wicked and fallen World. The Messiah will come back in the clouds of Heaven to rescue all who are waiting for Him. He will set up his Judgment throne in Jerusalem. Amen. The above statement is incorrect. The beast that rose from the sea is the Holy Roman Empire, the Beast that rose from the earth is the United States who gives it’s power to the first Beast, here’s no such thing as a final Beast coming. I fail to see how a nation can come up from the sea. The Holy Roman Empire was a nation just like the United States. And the United States never got its authority from the Holy Roman Empire. Then I saw another beast, coming out of the earth. He had two horns like a lamb, but he spoke like a dragon. He exercised all the authority of the first beast on his behalf, and made the earth and its inhabitants worship the first beast, whose fatal wound had been healed. The Kings on the Earth gets their authority from the Papacy. During the reformation, Martin Luther was about to be arrested and executed. He needed protection from kings and princes, who had received their authority, not from the abyss, bur from the King of Kings. The beast is obviously a person, not the USA. Can’t be the USA. The USA is already controlled by the vatican. The beast is the antichrist, and it is a future person. You have to trust this MESSAGES as it is coming from Heaven. And it is happening now! Link: thewarn….(Censored. External links not permitted on this site. Editor). thewarni……(Censored. External links not permitted. Editor). Every pope is evil, since every pope holds an office that doesn’t exist in the Bible and attempts to usurp Jesus Christ and truth. So the entire vatican is false, and always has been. Catholicism is a false belief system, it isn’t Christian and never was. Catholicism can’t get one person into heaven, as works cannot save. ….the False Prophet is preparing and is already present in the Vatican. … My beloved Vicar is being isolated …. Message clearly says the False Prophet is from Vatican cut not the current pope. Isn’t it. Watchfully and Prayerfully your Oldman. Sabbath Shalom, and love in Yeshua. You are truly an oldman on this site. We have debated a lot in the past, and we disagree. You seem to hold the view of the Pope’s butler. He claims the Vatican is full of corruption and evil. This may be plot to remove Pope Benedict XVI by anymeans. Message given on May 26th, 2012 at thewarningsecondcoming site. You duck the question. That is sad. Let me try one more time, to highlight what is going on inside the claimed “Holy mother church”. 1. How can the Pope be “Holy”, and the system that He is the head off produce evil? Please answer, or you will again be told to find another place to spread your messages. Is that the beloved vicar that wants to join hands with those who deny that Jesus Christ is the way, the truth, and the life? Do you think that Pope himself decide where to go and what to speak? I am again puzzled by your comment. You admit that some “evil forces” are in control of the Vatican, but feel the present Pope is a nice fellow. 1. The Pope is the head of the Vatican. Why do you feel the Pope is not the problem, or a part of the problem? 2. The Pope has been elected by the council of Cardinals. Are they a part of the evil in the Vatican, or is the source of evil at a lower level? Don’t you think we are in the LAST DAYS? For a long time, l was under fhe belief that the beast would be a political figure, and the false prophet a religious one (i.e. the pope). But, if you look closely at what the Word of God says about the beast in Revelation, as well as “the man of sin” in Paul’ writings to the Thessalonians…only the pope can fit that description. Tony Blair’s public embrace of the vatican last week (as reported on this website) was, l think, an excellent preview of the false prophet in actiion. Let us not forget that Rick Warren – ‘Americas pastor’ is a knight of Malta. Would he – possibly – share a common peace-plan whith the UN…? How big do we think his influence would be on (western) christendom? How bold of them to call themselves ‘saints’ According to the Random House dictionary copyright 1980, the meaning of the word “saint”: 1) A person formally recognized by certain Christian churches as BEING IN HEAVEN WITH GOD and as being entitled to veneration (to regard with religious respect) on earth, 2) A person of great holiness or benevolence. Saint Seige is not dead! According To God’s word here is the true definition of a Saint. Paul says, “Unto the church of God which is at Corinth, to those who have been sanctified in Christ Jesus, called to be saints, WITH ALL THAT ARE IN EVERY PLACE call upon the name of Jesus Christ our Lord both theirs and ours: 1 Corinthians 1:2 Paul says in Romans 1:7, “To all that be in Rome, beloved of God, called to be saints; Grace to you and peace from God our Father, and the Lord Jesus Christ.” Paul is not talking about just the Roman Catholic Church or he would have said that. He is talking to ordinary people, Jew, Gentile, rich, poor, slaves, prisoners, ect. Not in just Rome where Paul preached but the whole world The elect ones, The ones who accepted Jesus Christ as their personal savior! “For by grace are ye saved through faith; and that not of yourselves: it is the gift of God: Not of works, lest any man should boast.” Ephesians 2:8&9. Jew and Gentile! In the last day, the great day of the feast, Jesus stood and cried, saying, “If any man thirst, let him come unto me, and drink.” John 7:37. Call upon the Lord and thou shalt be saved. Not the Roman Catholic Church. See Vatican’s FAZZINI scupture …. named “Christ rising from nuclear bomb blast crater” ….. Vatican predicting nukes will END the current world order and USHER IN the soon to follow New World Order. Vatican owns the CIA …. CIA has access to nuclear bombs ….. CONNECT THE DOTS.